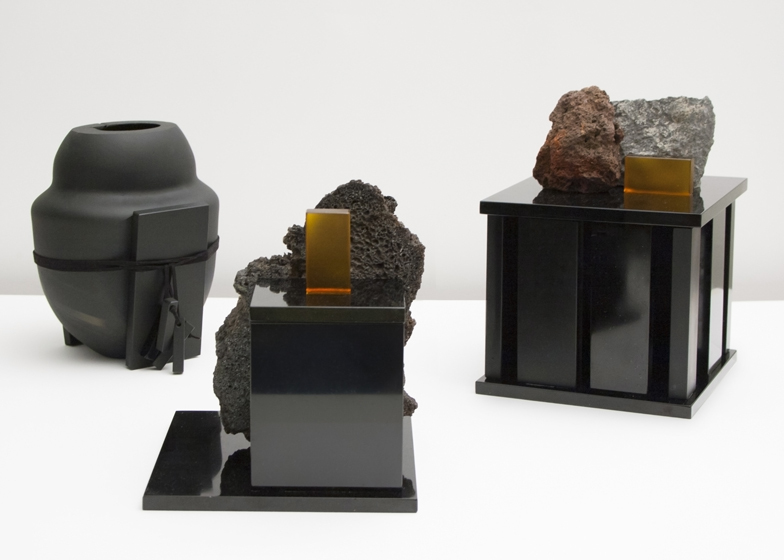 Milan 2014: objects made out of lava from Mount Etna in Sicily will be presented by design duo Formafantasma in Milan next week (+ slideshow). 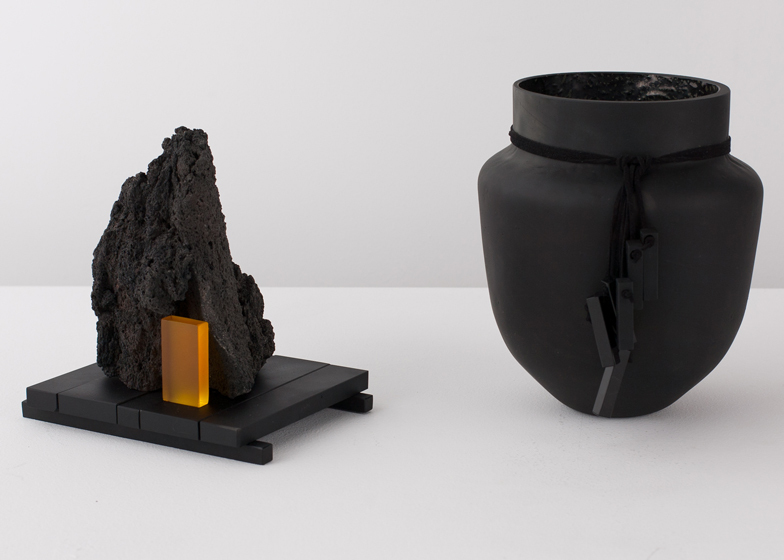 Sicilian-born Simone Farresin and Andrea Trimarchi of Formafantasma experimented with cooled lava from the volcano's eruption last year to create the De Natura Fossilium collection, made in collaboration with Gallery Libby Sellers. "When Mount Etna erupted on 20 November 2013, the dramatic event was broadcast by a haunting noise of rumbling stones and a vast plume of dark smoke that completely obscured the sun," said the designers. After the eruption, the lava cooled and solidified into dark grey basalt rock. Formafantasma collected samples of the rock from Etna and nearby Stromboli, which they melted and blew to create glass, wove into fibres for textiles and milled into various shapes. "When we experimented with the melting, mouth blowing and casting of lava, the research and tests took a really long time," Trimarchi told Dezeen. "The difficult part was to understand the right cooling time of the material. We had thousands of tests made that just cracked during the cooling time." The pieces were used to create stools, coffee tables and a clock with linear forms that reference the work of Postmodern designer Ettore Sottsass. Paired with brass elements, the rock has been cut to reveal strata and textures formed as it cooled quickly. A crater of powdered stone forms the base of a circular clock, which has brass hands that turn inside the depression. Sections of the tables and stools patterned by the air holes formed in the rock are held in place with brass plates and secured with threads. The glass was mouth-blown into vessels or moulded into boxes shaped like the dwellings at the foot of the volcano. A black mirror suspended on a string over a brass frame is balanced using a chunk of rock. Formafantasma's collection will be shown at Palazzo Clerici in Milan city centre from 8 to 13 April. "When Mount Etna erupted on 20th November 2013, the dramatic event was broadcast by a haunting noise of rumbling stones and a vast plume of dark smoke that completely obscured the sun. After the smoke, black earthen debris began showering down over the villages and cities within the immediate vicinity of the mountain. From the highway through to the Greek theatre in Taormina, everything was covered with black. Mount Etna is a mine without miners – it is excavating itself to expose its raw materials." Studio Formafantasma, in collaboration with Gallery Libby Sellers, present De Natura Fossilium – an investigation into the cultures surrounding this particularly Sicilian experience to bring both the landscape and the forces of nature together as facilities for production. 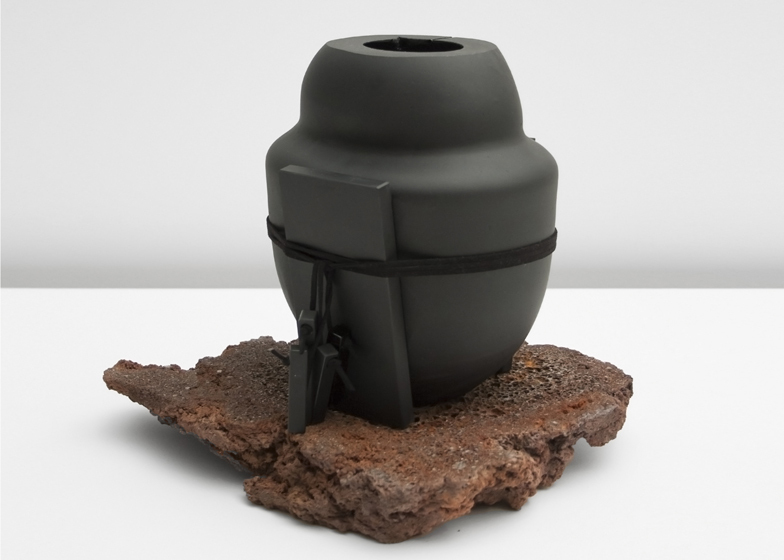 As in their previous projects Autarchy (2010) and Moulding Tradition (2009), Formafantasma questions the link between tradition and local culture and the relationship between objects and the idea of cultural heritage. De Natura Fossilium is a project that refuses to accept locality as touristic entertainment. Instead, the work of Formafantasma is a different expedition in which the landscape is not passively contemplated but restlessly sampled, melted, blown, woven, cast and milled. From the more familiar use of basalt stone to their extreme experiments with lava in the production of glass and the use of lavic fibers for textile, Formafantasma's explorations and the resulting objects realize the full potential of the lava as a material for design. In homage to Ettore Sottsass, the great maestro of Italian design and an avid frequenter of the volcanic Aeolian islands, this new body of work takes on a linear, even brutalist form. Geometric volumes have been carved from basalt and combined with fissure-like structural brass elements to produce stools, coffee tables and a clock. The clock itself is deconstructed into three basalt horizontal plates to represent the passing of hours, minutes and seconds. 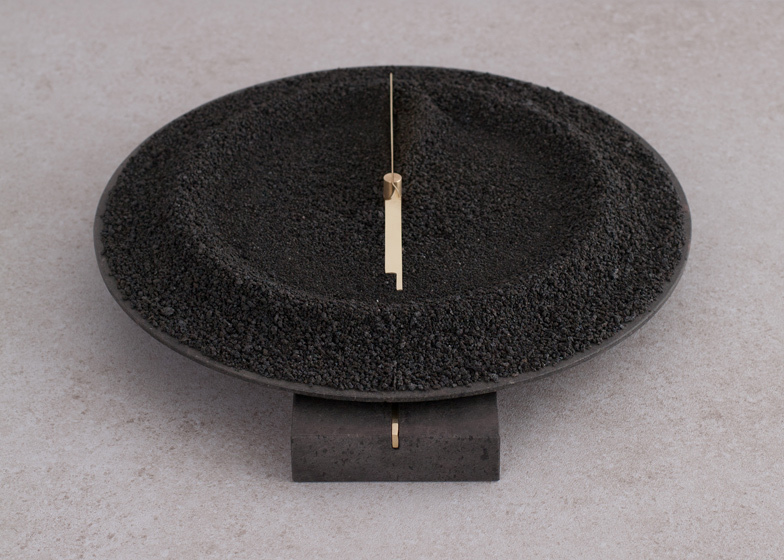 A brass movement spins around the plates, shifting three different ages of lavic sand that have been sampled from three different sites on Stromboli. Lavic glass, procured by remelting Etna's rocks, has been mouth-blown into unique vessels or cast into box-like structures that purposefully allude to the illegal dwellings and assorted buildings that have developed at the foot of the volcano. Drawing on their own vocabulary, these solitary glass boxes and mysterious black buildings have been finished with such archetypal Formafantasma detailing as cotton ribbons and Murano glass plaques. 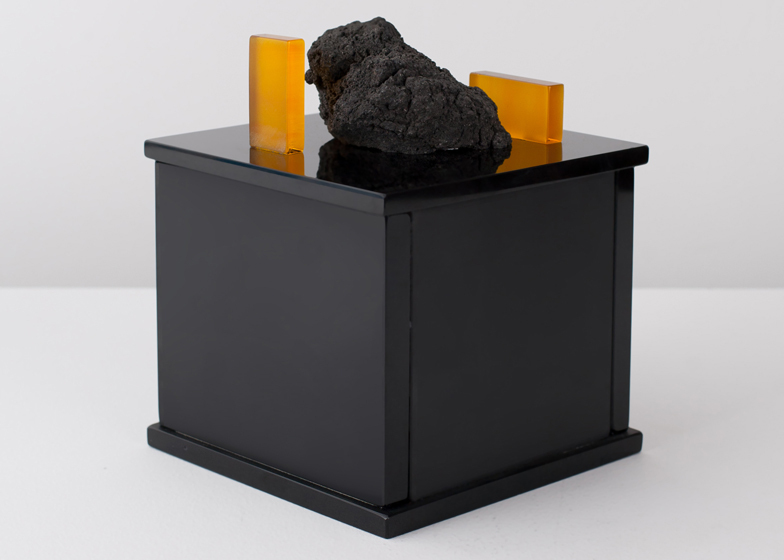 By returning the rocks to their original molten state Formafantasma are reversing the natural timeline of the material and forcing a dialogue between the natural and manmade. A black, obsidian mirror that is suspended on a brass structure and balanced by lavic rocks continues this line of narrative, as the semi-precious glass like stone is produced only when molten lava is in contact with water. Formafantasma have also investigated the tensile properties of lavic fibre and woven two different wall hangings. These pieces combine illustrative references to both the Greek mythological gods of Mount Etna and the microscopic views of lavic rock's geological strata as ascertained through the designers' collaboration with the Volcanologist Centre of Catania (INGV). As a sustainable alternative to carbon fiber, Formafantasma's use of lavic fibre has effectively reappropriated a conventionally high tech material for artisanal ends. All works are part of an edition, available exclusively through Gallery Libby Sellers, London. Supported by Creative Industries Fund NL.